How do you add an embedded player to your website? How do I embed my podcast to Wordpress? How do I share a show/episode on social networks? How do I download a episode? How can I distribute my show to TuneIn? Why isn't my widget automatically playing content again, as I had set it to? Can anyone download a show or a episode? Why can't my episode be downloaded? Can I share Spreaker content on my Facebook Page? How will my embedded player be affected if my live 24/7 unlimited broadcast suddenly drops? When I share my episodes to Youtube, SoundCloud, and Apple Podcasts, my content gets marked as being made with Spreaker. How can I remove that? Adding an embedded player featuring your show or episodes into your official site is a great way to keep all your content in one place. You can direct your listeners to your own page, but still have your hosting, play counts, and more taken care of by Spreaker. First, click on Embed, which can be found on both the show and episode pages. You can also click on the share icon, located on the website player at the bottom of the page. Full-Photo Background: if enabled, the episode (or show) image will be displayed in the player's background. Player Theme: the embedded player currently supports two color palettes, light and dark. Set it to the one that better fits your website. Player Height: opt to either keep the embedded player at its current size, or make it smaller or bigger by adjusting the pixel number. Play Automatically: choose whether or not you want the episode to be played automatically as soon as your page has loaded. When you share a show's embedded player, it will be set to automatically update with the latest episode you published from that particular show. However, when you share a single episode's player, it will play only that particular episode. In both cases, live episodes will also stream through the embedded player. Lastly, copy and paste the code provided into your website. If you have a WordPress page, then click on "WordPress? ", and copy and paste the new code provided. Just make sure to download the WordPress plugin beforehand. For instructions on how to get the code for your widget, follow the instructions provided here. When you begin any broadcast on Spreaker, you'll see a window featuring our auto-share options. Take advantage of them, as they're the simplest and quickest way to share your content on every major social network (Facebook, Twitter, Soundcloud, Tumblr, and Youtube). You can also manage show updates on these social networks from the Connected Account page in the Content Management System. To download a episode, go to the episode's page. From there, right under the episode's title, you'll see the option to "Download". You can also download the episode from the Content Management System - simply select your show, the episode and finally select the Episode Audio File option from the menu. You can distribute your show to TuneIn by adding any of the feed URLs you find here to the TuneIn website. Choose whether you want to add content that's already been published, or content that you intend to have streamed live. First, make sure that auto-play has been selected in your widget's settings. When you click on the Embed button to get the widget's code, pick "Yes" under Play Automatically. Keep in mind, however, that many devices do not support auto-playing (mobile ones in particular). So if the widget is set correctly, but it still isn't working, it may be due to your device's limitations. Yes, they can, but this option is customizable. The producer of the episode can decide whether or not to enable the download option. 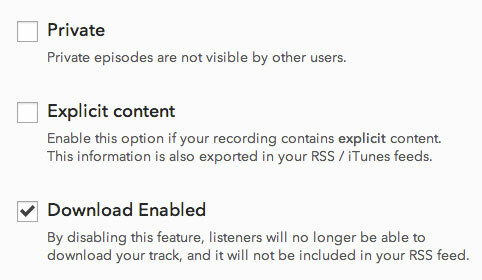 Downloading can be disabled from the edit page of your episode. Go into your episode's page and access its settings. You may have accidentally unflagged downloading and disabled it, or could have set it to private. From the Spreaker’s Content Management System, click on your show, and then the “Edit” Yellow button. Then, click the Autosharing Options section you can find from the menu on the left, connect your Facebook account, and then select the Page where your episodes should be posted. Then, while setting your episode data, before you broadcast, ensure that the Facebook button is enabled in your auto-share options. Now your episode from that show will be published to your Facebook Page. If you've set "autoplay enabled" on your embedded player, then your broadcast will start playing again automatically as soon as you're back on live. If you've shared a show player, then it will automatically update to the next episode you publish, as long as the embedded player is not currently being played. This means that listeners that are tuning in at the time will not have their listening experience interrupted, and that the new episode will appear only once they hit stop. However, if you've shared a single episode, the embedded player will be tied to that episode even when you will publish something new. If your embedded player displays a 24/7 unlimited broadcast that's currently offline, it will automatically update as soon as you come back on live. Upgrading to any one of our PRO plans will take care of that. Once you upgrade, the "Made with Spreaker" title addition to content shared on Youtube and SoundCloud will not be displayed, and the same goes for the "| Spreaker" title addition on podcasts submitted to Apple Podcasts.